If you want to connect your Hisense smart to WiFi network or a wired network for accessing the internet on your TV. If you don’t know how to connect Hisense tv to WiFi network or a wired network and your Hisense tv won’t connect to wifi. You can follow the below steps to connect Hisense smart tv to wifi. 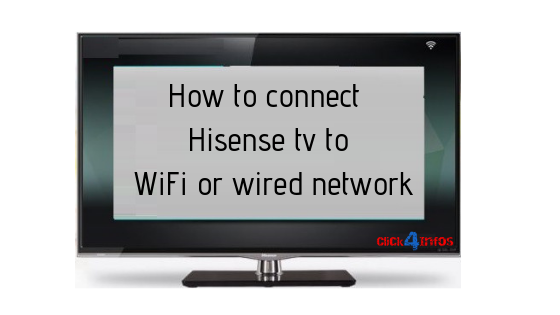 if your Hisense tv won’t connect to wifi, then you can follow the below steps for connecting to WiFi network. Take your Hisense remote control and press on the Settings icon button. After that, Select the Network option. if you want to check your Hisense smart tv already connect a network. Select the Network Information option for checking the active internet connection. If you don’t have any internet connection is connected to your Hisense Smart TV. You can select the Network Configuration option. After that, Turn on your wake on the wireless network and follow the all next instruction for connecting your Hisense Smart tv to an available WiFi network. If you want to connect your Hisense Smart tv to a wired network. Follow the below instruction for connecting the Hisense TV to a wired network. Firstly connect your Ethernet cable to your Hisense Smart TV’s Lan port and your External Modem or your Router LAN Port. Take your Hisense TV remote and press on the Settings button. Turn on the wake on Lan option and follow the all next instructions for connecting your Hisense TV to a wired or Ethernet network. Previous articleBuy 32-inch Android Smart LED TV at 4,999 RS.